What's going on with clowns these days? Roaming small towns in California, terrorizing people in France, missing entire mouths on American Horror Story? I don't know about you but I think the French town of Vendargues that has banned all clown costumes for the foreseeable future has the right idea. Earlier this month, Jezebel wrote about crazy, bloodthirsty clowns stalking the delicious cheese and fresh bread-paved French streets looking for mayhem. Instead of eating, these gangs of wandering clowns were apprehended with guns, knives and baseball bats. One clown even beat a man with an iron bar. 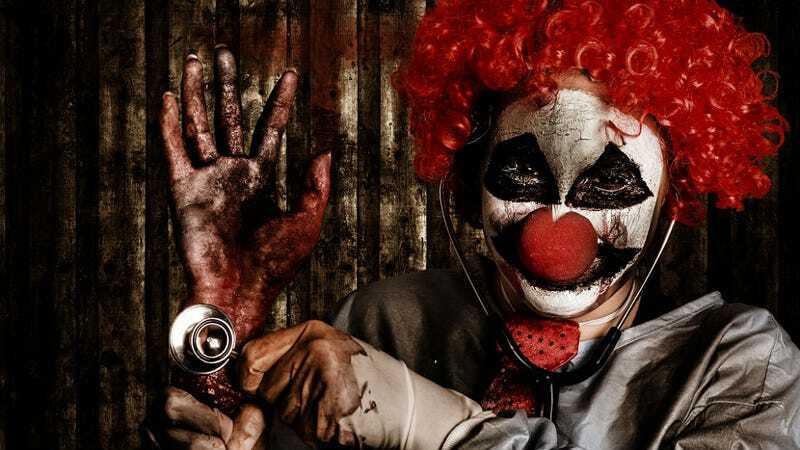 Vendargues isn't taking any chances with its Halloween parade this evening so Mayor Pierre Dudieuzere has banned all Twisty the clown look-a-likes in the town of 6,000, according to the BBC. No clown make-up or suits allowed, though maybe he should add bats, guns and knives to that off-limits list? Just sayin'.